Inflation is dead – long live inflation! We hear about the threat of hyperinflation in the media – is this for real, can it happen in the U.S.? Are we hyping up the word inflation, is it an inflationary play of words to grab attention to discuss the threat of hyperinflation? Let’s deflate the hype and put inflation where it belongs… at the forefront of your concerns. Stop right here. In the words of European Central Bank (ECB) President Jean-Claude Trichet, what we suggest is “extraordinarily counterproductive.” Discussing how policies pursued by the Federal Reserve (Fed) and other central banks might lead to inflation makes the job of central banks more difficult. That’s because the best predictor of future inflation may be inflation expectations. If people think there will be inflation, they are likely to have higher wage demands; similarly, businesses that believe inflation is baked into the system may continuously try to push for higher prices. The head of the ECB recognizes this and is rightfully concerned that this talk about inflation may lead to, well, inflation. In contrast, the Fed wants to make us believe that there is so much “slack” in the economy – economists call this the output gap – that there is nothing to worry about, inflation won’t happen. What the Fed and the ECB have in common is a “trust us” attitude, telling us that as long as we put our faith into the mighty hands of central bankers, we will be fine. And that’s where the fundamental problem lies: rational investors ought to make investment decisions based on an evaluation of facts, not based on nice talk by central bankers. At least the ECB talks straight; the Fed, however, started out by trying to square the circle. As squaring the circle may be impossible, the Fed is likely to add a dimension, possibly turning the circle into a balloon – inflation if you will. If the balloon pops, we get hyperinflation. The squaring of the circle is the phase we are in right now. A massive monetary and fiscal stimulus has been initiated to counter market forces. As a result, home prices have not fallen enough to be sustainable by incomes without substantial government subsidy – this may be the root of a most unstable situation that may lead to a fragile recovery at best. With interest rates low enough, the economy may indeed bounce from the bottom – economic activity had fallen to such low levels that many businesses had seen their inventories completely wiped out; if businesses wanted any sales, they had to buy at least some supplies. But in our humble opinion, the squaring of the circle is doomed to fail and the first signs are showing up in the bond market. That’s because the government piled on trillions in debt this year in addition to running the printing press in high gear. Investors are becoming concerned that this magic wand might just be inflationary down the road. If, and that’s a big if, there is confidence in the Fed that it can engineer an economic recovery that is not inflationary, then the bond market will behave; once the economy is back on track, the Fed will mop up the liquidity it has poured into the markets; the administration will scale back its spending programs and present a balanced budget; and we will have Martians visit planet Earth. The likelihood of each of the aforementioned happening may not be identical, but listing the Martians in conjunctions with the remainder may give you a sense of our confidence in any or all of these being realistic. Don’t underestimate the Fed, though: unless the public and foreign lenders completely lose confidence in the Fed, it has the power to control inflation expectations in the medium term. That’s why the markets react to Fed talk - when the Fed says all will be well, the gut reaction in the markets may be a sigh of relief. Even when Fed Chairman Bernanke warns Congress about unsustainable deficits, the markets seem appeased as if to express that Bernanke will impose discipline on Congress through higher rates if necessary. The real question, however, is whether the Fed is going to follow through on its promise to keep inflation in check; a task that has been made ever more difficult as the Fed has piled up mortgage securities on its balance sheet that may be difficult, if not impossible, to sell again; or at least neutralize the economic stimulus created with this and other “credit easing” programs. The challenge is that inflation may show its ugly head well before we have a sustainable recovery. As pointed out earlier, even if we have economic growth, we don’t think any recovery is sustainable if home prices continue to be only affordable at interest rates that are highly subsidized. That’s where the squaring of the circle is likely to fail. The Fed may actually want to have inflation to push up home prices; remember that inflation bails out those with debt (and punishes savers). Fed Chairman Bernanke has repeatedly argued that going off the gold standard during the Great Depression and allowing the U.S. dollar to fall versus other currencies was the key to ending the Great Depression. The Fed’s credibility is in jeopardy as it increasingly attracts political scrutiny; that’s because the Fed is meddling with fiscal policy these days: rather than “merely” printing money and setting interest rates, the Fed is providing money to specific sectors of the economy – the various lending and credit facilities, as well as active purchase programs of mortgage backed securities, amongst others, is squarely in fiscal territory, something that should be governed and supervised by Congress, not a central bank. Some central bankers are so frustrated with this talk about inflation because it further undermines their credibility – and credibility is key for central banks to get away with the policies pursued. There’s a simple solution to this mess: have central banks stop the printing presses, have central banks stop meddling with fiscal policies. If the Fed were to stop being engaged in the pursuit of what we believe may be highly inflationary policies, we wouldn’t need to warn about them in public! We are not alone in our calls: German Chancellor Angela Merkel recently received worldwide attention when warning central bankers that they must stop the printing presses. 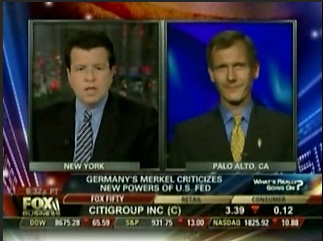 The warning carried all the more weight as it is most unusual for a German Chancellor to interfere with the independence of central banks; please view a replay of our discussion of the episode with Neil Cavuto on FoxBusiness TV. The reason why our calls may fall on deaf ears at the Fed is because the Fed is concerned that a premature unwinding of its programs could throw the economy into a depression – all the work to date to stabilize the markets might be in vain. We respectfully disagree in particular with the latter. Last October, the guarantee of the banking system ensured that the potential of a disorderly adjustment of the U.S. and global economy was averted; it opened the opportunity for an orderly adjustment. Orderly adjustment is a nice phrase for what may be a depression, but the alternative, inflation with the threat of hyperinflation may be, in our humble opinion, the worst of the alternatives. Now we mention it again: hyperinflation. So is it a real threat? The simple answer is: it depends on how the dynamics play out. What we do know is that all hyperinflation in the world has started when a country’s central bank prints money to finance government spending. The Fed adamantly denies that that is what it is engaged in, but when something looks like a duck, swims like a duck, quacks like a duck, we call it a duck. We intentionally use such strong language to send a strong signal that the policies pursued, in our view, are reckless and dangerous. We are based in California where, when one plays with fire, a lot of damage can result. Incidentally, California’s budget woes show just how serious the financial situation of many states is. State and local taxes are likely to go up, budgets will be cut further. Everyone is screaming for money; while even the Fed may not be able to save California, the Fed may be extremely reluctant to stop its accommodating stance given the grave situation so many consumers, municipalities and states are in. In our assessment, the scenario the Fed would favor is a prolonged period of elevated inflation; some estimates are from 4% up to 7% or 8%; others higher - that’s the circle turning into a balloon. But the Fed cannot allow inflation to grow that high without a serious plunge in bond prices, pushing the cost of borrowing for home owners, as well as the government, to very high levels. We would like to point out that the government currently pays fairly little in interest expense since the government played the same “adjustable rate mortgage game” consumers did; remember how the government phased out the 30 year bond (“long bond”) during the Clinton administration? Well, the “long bond” is back, but 40% of the federal debt is maturing this year and has to be rolled. It has been puzzling that the government has not taken more advantage of the low long-term rates; a strategy we believe will exacerbate the cost of government debt in the long run. Back to what the Fed may be most concerned about: the economy, in our view, is likely to stall with long-term rates going up much further, if the Fed is not able to keep mortgage rates low. Right now, the Fed is very actively subsidizing this market, printing a lot of money in the process. At some point, we are concerned market forces will overwhelm the Fed. Right now, the Fed insists it is not trying to keep rates down; it is merely “facilitating” the flow of credit. We believe such comments undermine the Fed’s credibility as, for example, the massive purchases of mortgage-backed securities, are in our view clearly aimed at keeping rates low. Nothing during the financial crisis seems to have worked as planned by the Fed. Policies have been far more expensive as the Fed’s credibility has eroded. The Fed has repeatedly shown that it completely underestimates the political dimensions of its policies. Will the market really buy its tough talk? And if not, what will happen? If the Fed substantially increases its market interference, it can lead to hyperinflation down the road. How likely? We are reluctant to quantify it, but the risk is real. The appropriate way for the Fed to regain credibility may be to not only announce that there is a viable exit strategy to the policies that have been pursued, but to embark on it. So far, this hasn’t happened, the printing press continues to be very active with the Fed’s balance sheet growing steadily. We hope the balloon won’t pop, but hope is not a strategy. Needless to say, these policies may be detrimental to the U.S. dollar because foreigners may have little interest in buying bonds with artificially low yields due to the Fed’s activities; while the U.S. should be able to finance its massive deficits, lenders want to be compensated with free, i.e. market-based prices. Did we mention that we believe the Fed may favor a weaker dollar? It might just be getting more than it is bargaining for. Mr. Merk predicted the credit crisis early. As early as 2003 , he outlined the looming battle of inflationary and deflationary forces. In 2005 , Mr. Merk predicted Ben Bernanke would succeed Greenspan as Federal Reserve Chairman months before his nomination. In early 2007 , Mr. Merk warned volatility would surge and cause a painful global credit contraction affecting all asset classes. In the fall of 2007 , he was an early critic of inefficient government reaction to the credit crisis. In 2008 , Mr. Merk was one of the first to urge the recapitalization of financial institutions. Mr. Merk typically puts his money where his mouth is. He became a global investor in the 1990s when diversification within the U.S. became less effective; as of 2000, he has shifted towards a more macro-oriented investment approach with substantial cash and precious metals holdings. The Funds may be appropriate for you if you are pursuing a long-term goal with a hard or Asian currency component to your portfolio; are willing to tolerate the risks associated with investments in foreign currencies; or are looking for a way to potentially mitigate downside risk in or profit from a secular bear market. For more information on the Funds and to download a prospectus, please visit www.merkfund.com. Investors should consider the investment objectives, risks and charges and expenses of the Merk Funds carefully before investing. This and other information is in the prospectus, a copy of which may be obtained by visiting the Funds' website at www.merkfund.com or calling 866-MERK FUND. Please read the prospectus carefully before you invest.